Presenting 507 W. Edgewater: a stunning custom-built 5 bedroom, 4 Â½ bath estate with expansive, unobstructed main channel & turning basin views in one of Orange Countyâs most prime & sought-after locations. Situated on a rare, corner lot, this elegant yet current design effortlessly exudes the southern California lifestyle of seamless indoor/outdoor living. At nearly 3,900 square feet, the light-filled property boasts attention to detail, creating a striking canvas for the finest materials and finishes. The exterior is beautifully detailed with smooth hand-colored & applied stucco, stone masonry highlights & slate roof reminiscent of a French style chateau. 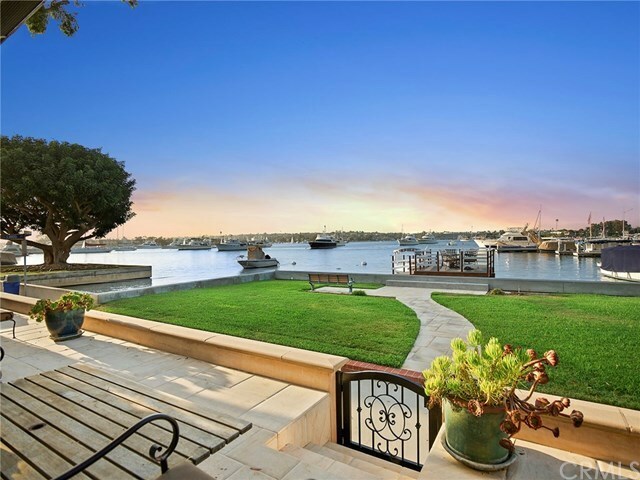 With 50 feet of bay frontage, recently redone seawall & private dock designed for a 63' vessel & a side tie, grassy area & a roomy patio for alfresco dining, this home was created for year-round entertaining. Handsome limestone & hardwood flooring flow throughout the open floor plan & accentuate the numerous highlights, including a gorgeous staircase with wrought iron design, stone-clad fireplace, custom wood built-ins in the living room, state of the art chefâs kitchen with professional-grade appliances, custom wood cabinetry & stone counters, & a generous master suite featuring panoramic harbor & water views. Large guest rooms, upstairs laundry room, whole-house surround sound, 2-car garage, & close proximity to world class shopping, dining & pristine beaches make this property the ultimate coastal waterfront retreat.